This year’s 16th annual Desjardins Merit Scholarship Evening was a huge success. 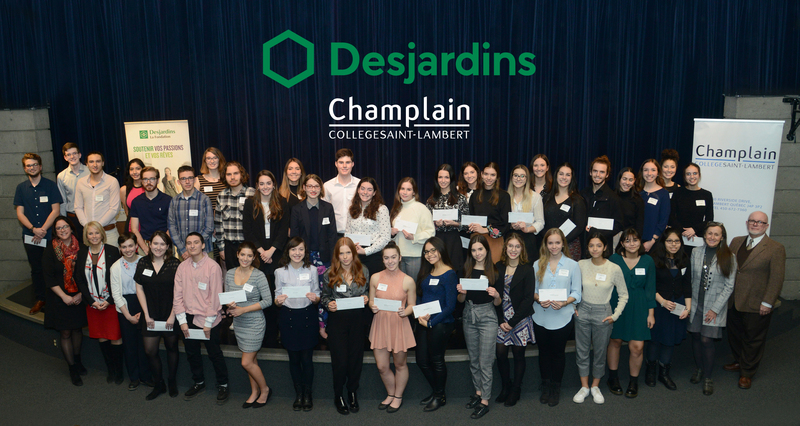 The Champlain College Saint-Lambert Foundation, Groupe Excelso and Caisses DesJardins de la Rive Sud de Montréal awarded Champlain students who have demonstrated a commitment to academic excellence. On behalf of everyone at Champlain College Saint-Lambert, we wish all our winners every continued success. Candidates who have completed 2 semesters in their pre-university or 4 semesters in their technical program are eligible for these $750 scholarships. The successful candidate has achieved the highest academic average in the required General Education courses. Congratulations to Isabela Adelina Gorea – Pre-University Program and Rachelle Patenaude – Career Program. The Excelso Scholarship is given to the incoming student with the highest overall average from high school, selected outside of the pool of program-based entrance scholarship winners. Congratulations to Dzmitry Fiodarau – Health Science for winning this award. The Caisses Desjardins de la Rive-Sud de Montréal awards scholarships to students enrolled full-time in a program who have obtained the highest R-Score in the first year of their studies without any failed courses. Each award is valued at $750.